The state of being Jewish is not a straightforward thing to define. It’s a religion, sure. But it’s also a culture, a shared history. It is food and festivals and traditions. Within that one word there are orthodox, reform, Chasidic … and those who’d call themselves Jew-ish. Some people would call themselves Jewish, even though they would also consider themselves atheist. 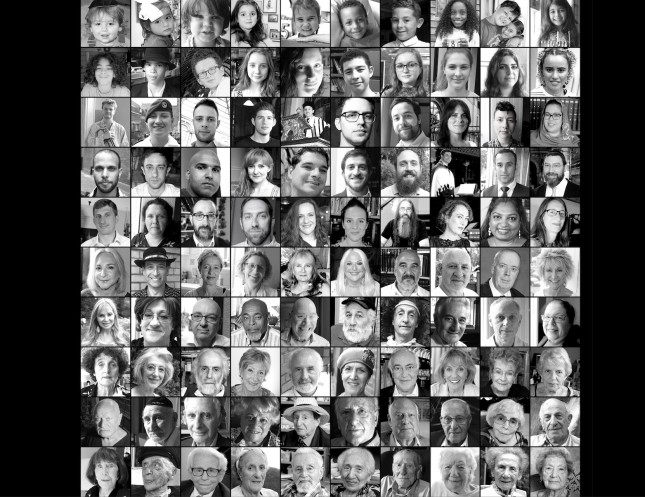 It was fascinating, then, to see that this new short film, 100 Faces (which premieres at the UK Jewish Film Festival) asked what it means to them to be Jewish to Jewish people of all ages, going up in age year by year, from ages 1 to 100. Some of the faces are well-known, including the likes of Maureen Lipman, Dame Esther Rantzen and Stephen Berkoff. Some answers are spoken, some are sung. Some responses are cheeky and funny. Some are sad and sombre. Some talk about hope and being decent while others talk about suffering and fighting persecution. A few talk about food, others about Israel. The answers are varied and go some way to showing just how ridiculous any generalisation sounds. Because whether it’s religion, race, gender, sexual orientation, a group of people are not one idea. They are a sum of their parts, a collection of shared experiences, perspectives and history. Sadly, unlike many short films that still feel complete despite the short running time, the brevity here does not work in the film’s favour. It feels like the surface has merely been scraped. The brief snapshot director Benjamin Till offers here required just a little more cohesion. Intriguing and thoughtful but lacking in cohesion.